Tonight in Lexington, Kentucky, Duke’s Christian Laettner will lead a coalition of players that have terrorized Kentucky in the past against the Big Blue All-Stars, a group of UK alumni that includes Rajon Rondo, John Wall, and several other Wildcat standouts. 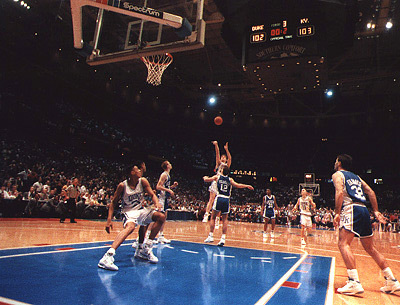 Laettner is, of course, the natural choice to coach a team against Kentucky (something about a perfect game and a foot stomp?). Beyond Laettner, though, there are a nice pair of additional ACC players involved in this game on the villain side: Tyler Hansbrough and Nolan Smith. 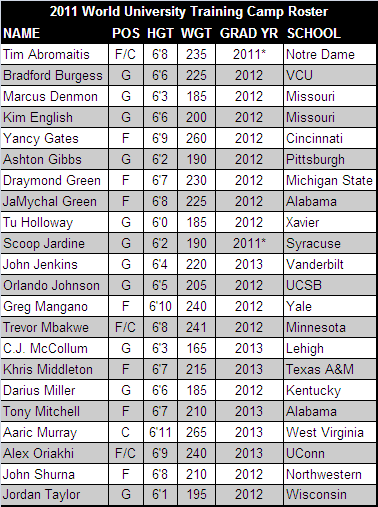 Hansbrough in particular is a nice pick-up for this team. Despite a lack of postseason showdowns, Hansbrough’s North Carolina team beat Kentucky in each of his four years in Chapel Hill. More importantly, though, is that he is Tyler Hansbrough, one of the most polarizing players in recent college basketball history. While North Carolina’s fans may adore him, Hansbrough’s awkward, sometimes-clumsy, and freakishly intense play irritated all sorts of college basketball fans on a national level. If I had to bet, I would expect that he will the recipient of some the night’s most fervent jeering. Nolan Smith is a more interesting case, mostly because he never played against Kentucky. However, as a Louisville native, the son of former Louisville star Derek Smith, and perhaps most importantly, a star player for the Duke Blue Devils, I expect that Kentucky fans will have no trouble summoning a healthy disdain for the reigning ACC Player of the Year. 2011 World University Finalists – Will the Next NPOY Be Buried on the Bench Again? It’s a guard-heavy group, as Pitt’s Ashton Gibbs, Xavier’s Tu Holloway, Vanderbilt’s John Jenkins, and Wisconsin’s Jordan Taylor all have All-America potential in 2011-12. This isn’t surprising, as many of the better big men in the game have either opted out of international basketball this summer (Kentucky’s Terrence Jones; Ohio State’s Jared Sullinger), or they’re moving on to NBA riches (Arizona’s Derrick Williams; Georgia’s Trey Thompkins; Kansas’ Morris Twins; Purdue’s JaJuan Johnson). It’s notable that Syracuse’s Scoop Jardine (2010), Northwestern’s John Shurna (2010, 2009), Kentucky’s Darius Miller (2009), Gibbs (2009), and Alabama’s JaMychal Green (2008) have all had previous international experience, which would presumably give each a leg up to make Jim Boeheim’s team this summer.